The CityFibre, Sky and TalkTalk joint venture has been underway for a while now and while still only open to trial users we have now seen our first speedtest. While the service is Gigabit based people may think the result above is slow, but the device used for the test was an iPhone 6 so the speed limitations of Wi-Fi are a big factor but still its more than double the speeds possible over VDSL2 currently. The postcode where the test was carried out appears to have Virgin Media cable services available to it, but no Openreach superfast services. Some people have been worried the router used by Sky would not be up to the task after the relatively poor Wi-Fi offerings from the Sky Hub but the speed test featured while not perfect shows what is possible and we look forward to the first tests over Gigabit Ethernet. I'm using on the sky 1GBS trial and getting 947mbs down and up on speedtests. Part of York CityFibre trial area or one of the other test areas? cheers, any reason why not TBB? 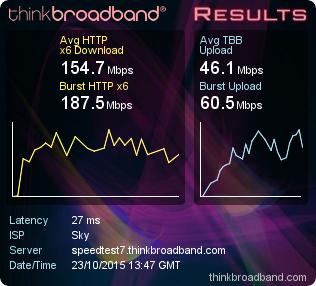 The TBB speedtest is very inconsistent. Not sure what is inconsistent with that test. The tbbx1 behaviour is invisible on many other testers as they don't run a test like that. It seems to be a trend thats going to form as faster and faster products comes out due to the limitations of single streams and most things being multiple streams now anyway... and the idea of a Gigabit service isn't to serve one service, its to share between many devices so 4 devices getting 250Mbps each is a very fair share IMO. Anyway, it looks quite good, hope you'll keep us in the look with any developments, may I ask where about your located? Sky has in its time ran a handful of Gigabit FTTH trials to explore the costs and viability of deployment using products like Openreach PIA or their own poles and ducting.